Found a guy offering walnut “scraps” that he was just going to burn if nobody wanted. Went over and ended up taking this stuff home. A ton of walnut, all about 2” thick and it looks pretty clear. For a little size reference, the board in the middle with the “2” on it is roughly 2”x6”x18”. All total, probably 45 bd ft of Walnut. Now to try to figure out what to do with it. All I’ve come up with so far is maybe try to piece it together into a desktop. Sort of a random pattern of rectangles and squared. If you’ve had the “problem” of a bunch of small scrap and came up with a good solution, I’d love to hear it. You were right in grabbing it. I would probably resaw it for boxes. Make cutting boards with it, boxes, business card holders, wine bottle balancers, or tea candle holders… Or 1000 other things. Glue ‘em up and turn rolling pins from them… If you cut them to uniform sizes and glue them up, you can make almost anything from your score! that’s what I am trying to decide on…a ton of little projects like you mentioned, or see if I can use it all on one project. I like the idea of pointing at a nice piece of furniture and saying “see that, it was 15 minutes away from being doused in gasoline and set ablaze”. Im sure the story would get more and more dramatic over the years as well. All these posts are giving me the box itch (get your mind out of the gutters), but unfortunately I dont have a good way to resaw. I’m happy you were able to salvage that wood. It’s a terrible testimony of the human species to have so little regard for something so minor as scrap Walnut that he would burn it. 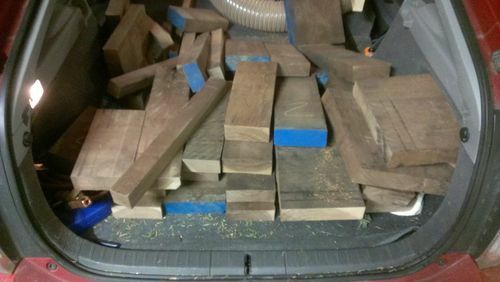 Looks like enough wood to make a coffee table and a pair of end tables. Especially if you got some maple and used it for contrast. You could re-saw and book match tops for end tables. great save on the walnut,whatever you decide to dowill be agreat experience! You wouldn’t find any “scrap” in my shop that big ….. or nice. Great score! I keep the littlest pieces I can’t see why he would burn this stuff. I would keep in touch with the guy or at least ask if he burns that kind of scrap often. If you have a lathe, they’d make great turning blanks for chess pieces, chisel handles, whatever. There’s always cutting boards, jewelry boxes, chests, etc. So much can be done with pieces that size. You were lucky see it and stop them because that is some pretty expensive firewood! haha I would hate to see actually how many people burn fallen trees in a burn pile that could otherwise be resawn into good lumber. Marcus- There was a really nice walnut table posted in the past couple of days where he pieced the top together using random lengths like wood flooring. It turned out super nice and looks like you’ve got enough for a smaller version. I’d post a link but that isn’t in my skill set! Sorry.